Table toppers are perfect December projects--they sew up quickly, and it's so satisfying to add a little sparkle to your seasonal decorations. 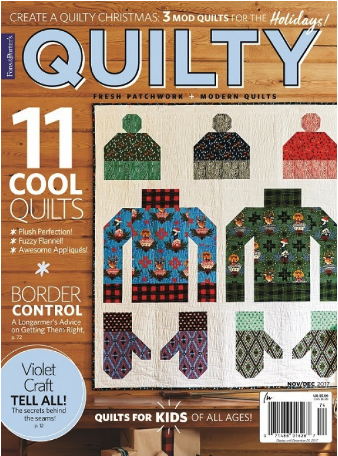 Christina McCourt designed this Snowflake Topper for the November/December issue of Quilty magazine. She used the snowflake-themed prints from Kanvas' Winter Story collection. We asked Christina to tell us about her unusually shaped topper. What attracted you to the Winter Story collection? I absolutely love the colors in the Winter Story Collection—the red, green, white and black fabrics. Fabrics with a black background are awesome because they really show off the colors and designs. 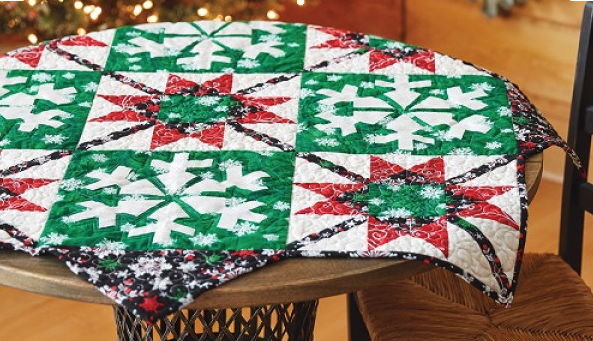 My favorite is the black print with the red, green and white snowflakes. They are all beautiful fabrics though! We love the shape of your table topper. What made you go beyond a square? Any tips for binding the angles? I knew I wanted to do something that wasn't a square, a rectangle or a circle. I wanted something in an odd shape. By adding triangles to the sides, I achieved what I was looking for. I have used this shape before on a Christmas tree skirt. I just cut width of binding strips for the binding. However I wish that I had done bias cut binding. It would have had more give for the angles. For the inner corners I snipped them so that when sewing on the binding I could "straighten" the side to sew on the binding. Can you tell us about your design? Once I had decided on the shape, I had to choose a theme. I wanted something that could go beyond the month of December, so I decided on the applique snowflake block. 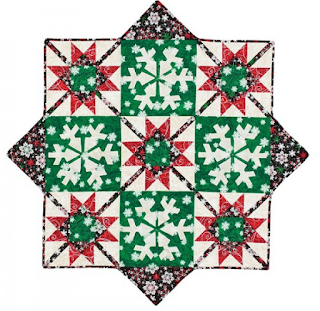 I auditioned several blocks before deciding on the pieced snowflake star. 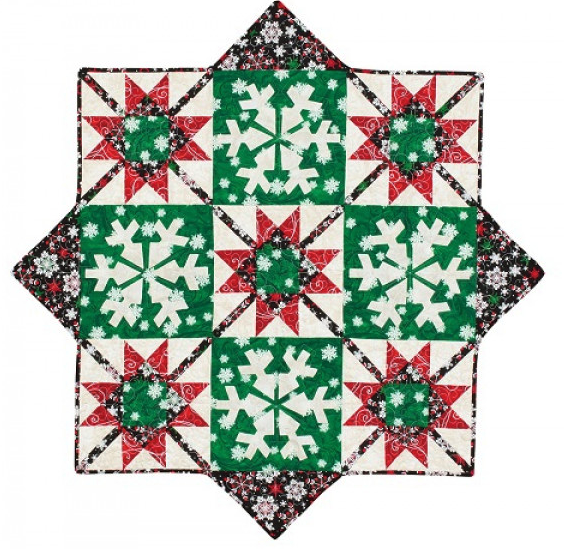 The lattice in the snowflake star provides a wonderful secondary design that connects it all together. I used the same fabric for the binding to pull it all together. Using Winter Story allowed me to stay with the snowflake theme. I like everything about it really. If I have to choose one thing, then, I like the applique snowflake the best. The snowflake stands out against the green fabric. It is fairly simple applique. Anything else you’d like people to know about this quilt? Don't let the odd shape or the applique scare you off from doing this project! Click here to purchase the Snowflake Topper pattern individually. Click here to purchase the Snowflake Topper kit.